Walking with Jesus: Day 117: Luke 8:26-56 & Psalm 117 - Why Does God Repeatedly Tell Us Not to Fear? Day 117: Luke 8:26-56 & Psalm 117 - Why Does God Repeatedly Tell Us Not to Fear? Why Does God Repeatedly Tell Us Not to Fear? A popular Christian teaching claims that the Bible tells us to "fear not" 365 times, one for every day of the year. Well, that's not quite accurate. The Bible uses the phrase "fear not" or "do not fear" ~80 times, depending on which translation you use. It uses other similar phrases like "do not be afraid" or "do not be anxious" or "do not worry" dozens of additional times, too. 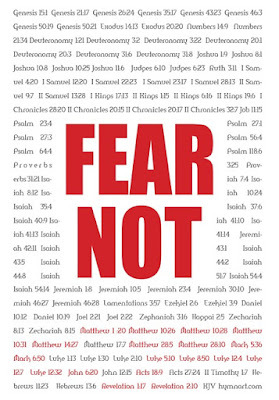 So, while it may not all add up to 365, the Bible certainly repeatedly tells us not to fear. In fact, "fear not" is the most common command given in the Bible, by far. So, why does God tell us not to fear so often? Well, Jesus' words to Jairus help us understand the fuller meaning of "fear not." Jesus tells Jairus, "Do not fear; only believe." The opposite of fear is faith. God doesn't just desire to see an absence of fear in our lives, but the presence of a vital and life-changing faith. The command "fear not" is usually given at two different times: In response to the appearance of an angel or the Lord to one of His people and in the face of great difficulty or problems. When an angel or the Lord appears to someone, the most common response from the person is trembling and the most common words spoken by the angel or the Lord is "fear not." God wants His people to have a holy fear, a deep and abiding reverence, but not a paralyzing terror or fearful anxiety about Him. He wants us to know that we are loved. While we tremble before Him, we do not need to be afraid. Yet life is filled with challenges and difficulties. Life is hard and the fall has broken God's good creation in many ways: cancer, heart attacks, violent crime, terrorism, political unrest and sin can all paralyze us with fear. In these times, God speaks "fear not" because He wants to re-orient our hearts toward Him. He wants us to know that nothing in this world can stand against those who belong to the Lord. We have no reason to fear. In response to the paralyzing anxiety and distress that can be caused in our minds and souls by both God Himself and by the world around us, we need to trust the Lord. We need to know and believe that God is for us. When we are terrified of the wrath of God, we need to remember that because of Jesus Christ, God is indeed for us. When circumstances overwhelm or some challenge terrifies us, we need to remember that it is Almighty God who is indeed for us. God demonstrated His love and power in so many ways in today's passage: casting out a Legion of demons, freeing a man from life-long torment, healing a long-term chronic disease, and raising a little girl from death to life, The same Jesus who did these things sits at God's right hand praying for you forever! The same power that rose Jesus from he grave now lives in you, if you believe in and belong to Him! Oh Lord, may all the nations praise You and all the peoples extol You, for Your steadfast love is great and Your faithfulness endures forever! May the name of Jesus be praised in every tongue by every people! Amen.